After failing miserably at trying to eat brunch at Morning Glory, we kept our feet moving and ended up on South Street. 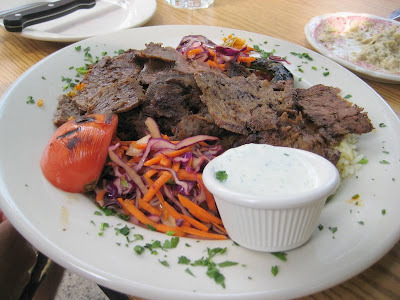 We went to S&H Kebab House and man, it was awesome. It was another nice day, so we dined outside. They have a great lunch special. 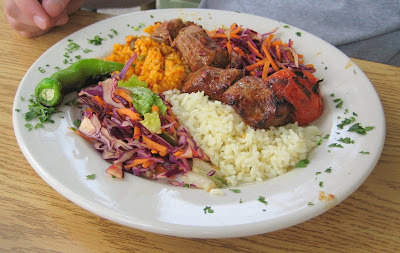 When you buy a kebab dish, you also get an app or a salad. So we tried it all – hummus, babagannush, and tabuli. All three were excellent. And you get a heap of warm sliced pita! Yey for warm sliced pita. I love me some eggplant. I need to learn how to make my own babagannush. J got the shish kebab which is grilled lamb chunks. All of theses lunch platters are served with two different types of rice pilaf (one regular and one spicy), and two helpings of a refreshing cabbage and carrot slaw/salad type thing, plus grilled tomato and a grilled green pepper. Seriously, everything on this plate is awesome. J got the doner kebab, which is the thinly sliced lamb. Also amazingly delicious. I kept stealing bits and making little sandwiches with it using the pita. 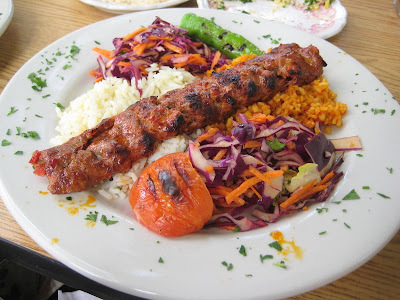 I got the adana kebab, which is chopped lamb with a bunch of seasonings, which happens to be a bit on the spicy side. Loved it. Absolutely loved it. The service was odd. Our actual server was completely bonkers. He was older and seemed to be in outer space. Like completely out of it. And we also had the owner (or someone who certainly seemed to be the owner) also wait on us a lot. And he was attentive. Perhaps too attentive. A bit too much. So it was a strange combo. It would have been lovely to have had a happy medium. Another fine meal, and a nice and inexpensive one at that. Thanks to J for the suggestion!